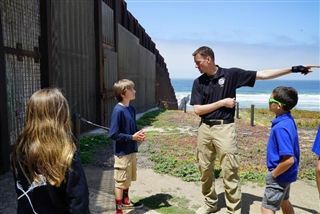 Immigration is an extremely complex issue and to get a better grasp on it, seventh graders traveled to the U.S. - Mexico border to hear from U.S. border patrol agents. Students were able to ask questions and visit Friendship Park, which lies between the two borders and allows people from Mexico and the U.S. to reunite for a brief period on weekends. Afterwards, the group visited Chicano Park to photograph the vibrant artwork and learn about the history of San Diego's Mexican immigrant community.